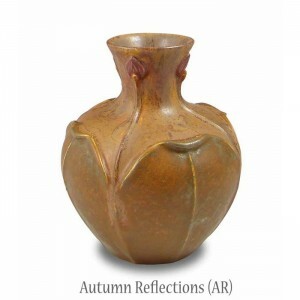 The classic leaf-and-bud pattern repeats four times around the vase. Autumn Reflections glaze. -thrown, sculpted & glazed by hand -5.50H x 5.25W -traditional earthenware art pottery is porous, liner recommended for use with water.